This is beautiful Cornish stone from Lantoom Quarry. The building face of this walling stone is the brown natural face and the back face of the stone is sawn to give a 100mm (nominal) bed depth. 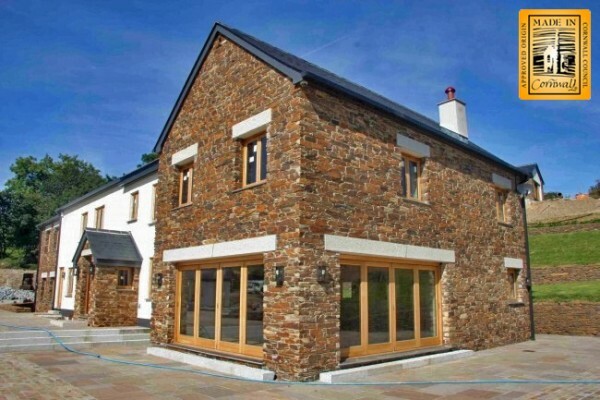 This is our most popular building stone material and has been used in a wide range of projects to give a quality finish to a building project. The price is for 1 tonne of Cornish stone. This is stunning Cornish stone from Lantoom Quarry. The building face is the brown natural face and the back face of the stone is sawn to give a 100mm (nominal) bed depth. The back face of the stone, being sawn, has a blue grey colour and normally this would be built into the wall so the natural brown face is visible. The stone is typically used as a facing stone, either built against a block wall, or as the outer leaf of a cavity. Some of the ends of the stones supplied are sawn square with the face and can be used as quoins (corner stones). The sawn face of the quoins will be blue grey in colour. The stone is supplied in pallets and shrink wrapped and is supplied by the tonne. This Cornish stone will cover approximately 4m2 per tonne supplied. Standard pallets are 1 tonne in weight. Please be aware the price listed above is excluding VAT.